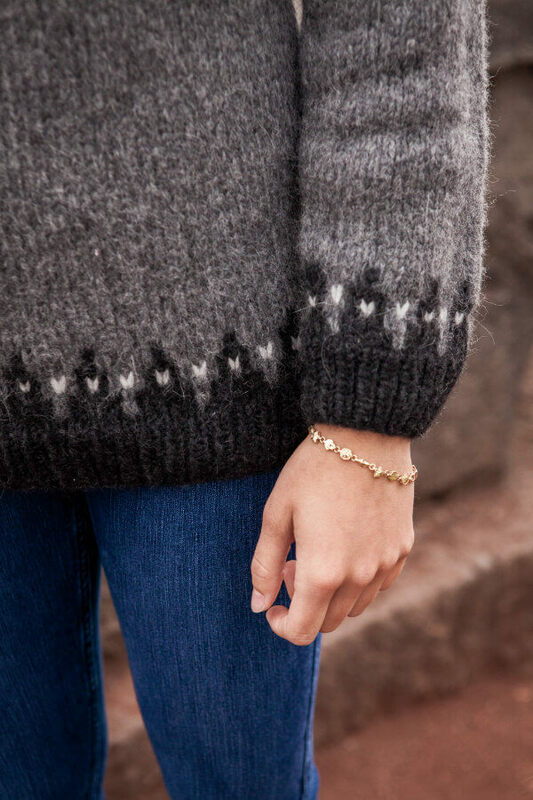 I have a thing for Icelandic sweaters. There are several reasons for this obsession. First, I’m cold almost all winter, and Icelandic sweaters are hands-down the warmest garment you could possibly get away with wearing indoors. 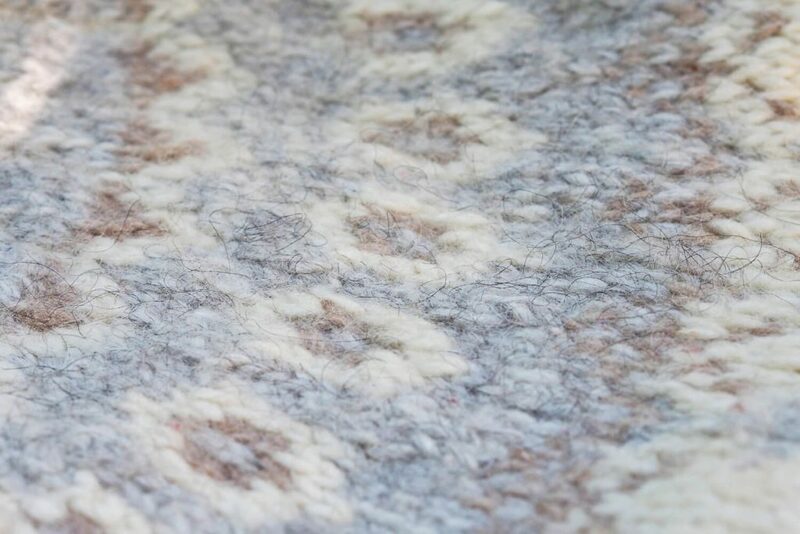 Lopi wool from Icelandic sheep has a unique dual-layer quality, combining the long water-resistant outer wool with the soft, fluffy insulating inner wool. This long-and-short combination makes Lopi yarn warm and water-resistant, with both the hazy look of fuzzy yarns and the sheen of a smooth fiber. Lopi, in my humble opinion, is the best wool on earth. 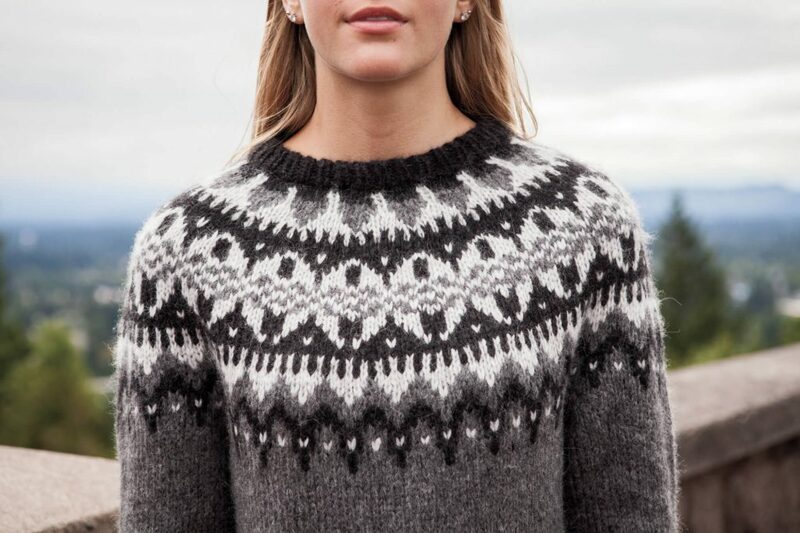 The second reason I love Icelandic sweaters is because they are perfection when it comes to design. It is absolutely amazing to see what can be done with three or four colors of bulky weight yarn. They tend to follow a sort of formula: a few rounds of pattern above the ribbing on the body and sleeves, and a more elaborate pattern in the yoke. They are generally worked in the round from the bottom up (my favorite method) and, if done right, are completely seamless, making for easy finishing (also my favorite thing). 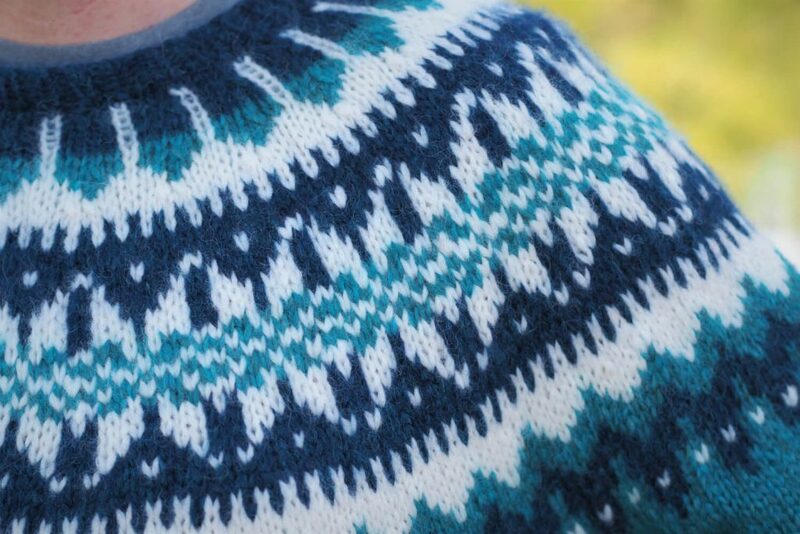 Once you’ve made one Lopi sweater design, you have a sense of how to make every other Lopi sweater design. All that changes are the colors and patterns. 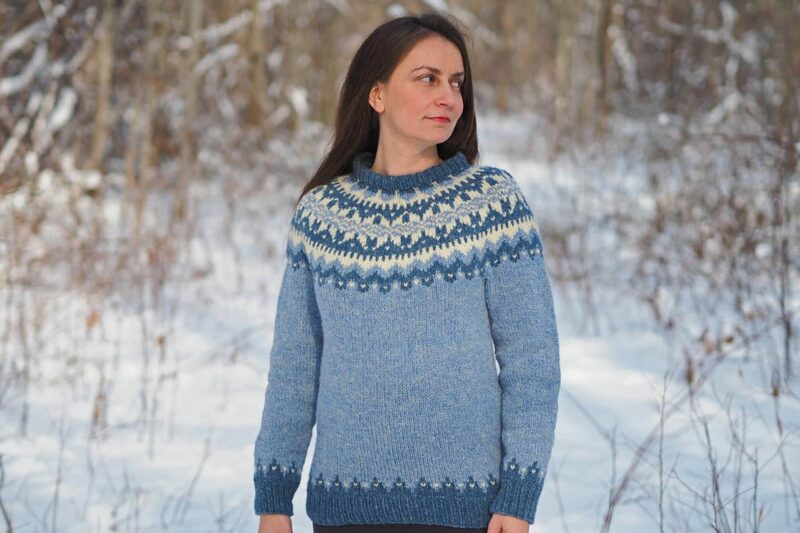 Because I love Icelandic sweaters so much, I’ve always wanted to try my hand at designing my own. And when Knit Picks put out a call for yoke sweater designs early in 2017, I couldn’t resist. The problem was that Knit Picks does not carry a Lopi equivalent. All the better! 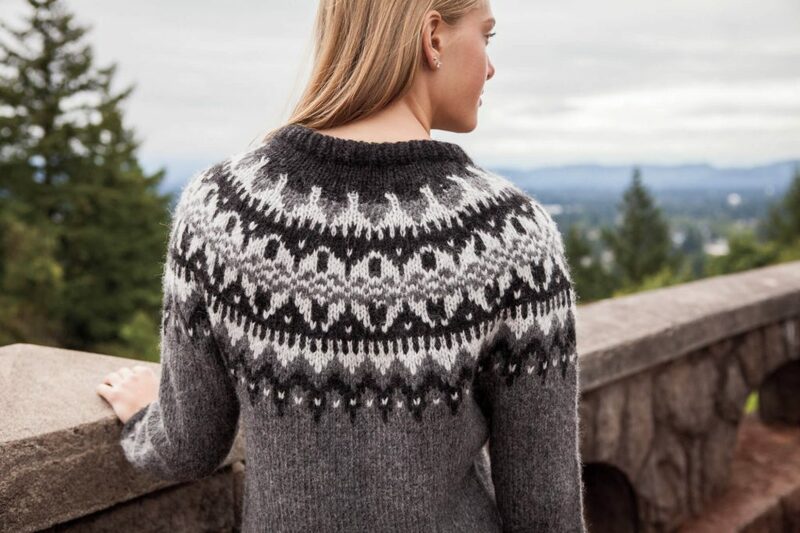 I could make a design completely my own, for a slightly different gauge and style of yarn but using Icelandic design as my inspiration. I had used Knit Picks Wonderfluff yarn once in the past and absolutely loved it. Wonderfluff is both weird and fantastic: it is completely unspun baby alpaca and merino wool fibers, which are “blown” into a nylon mesh “tube,” kind of like how you blow insulation into the spaces between the walls of a house. You don’t see the nylon mesh at all, because the fibers fluff out through the tiny holes. The result is this strangely light-weight but strong yarn which is easy to work with, snuggly soft, and RIDICULOUSLY warm. As in, it might rival Lopi wool for warmth. You are basically walking around with a baby alpaca-sheep fleece on your body. It’s pretty awesome. 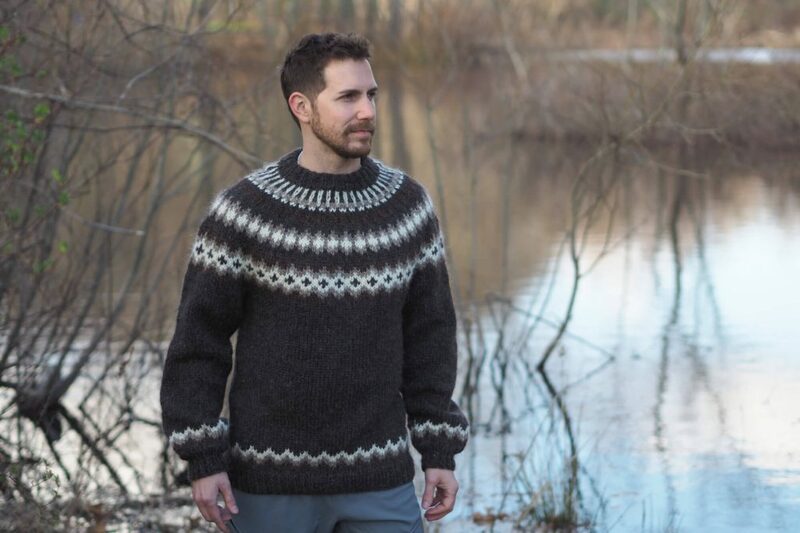 It’s also a bulky yarn, though not so bulky as Alafoss Lopi (approximately 16 sts to 4”), and I figured it would be perfect for an Icelandic style design. I wanted my design to have a traditional look to it, but with something of my own aesthetic to it. So I began messing around with charts until I got the sleeve and hem border pattern set. I wanted something palindromic: a pattern that would merge into its opposite. I settled on this simple peak-and-valley pattern, punctuated by accent dots in the third colorway. Let me tell you that yoke patterns are deceptively difficult to work out. First of all, the yoke needs to incorporate several decrease rounds into the pattern. A good yoke pattern hides these decreases well, so they fit right in to the design without screaming “decrease!! !” Another thing with yokes is that they need to be longer or shorter, depending on the size of the sweater itself. A 32” chest is going to have a shorter yoke than a 52” chest. So, the designer needs to figure out which rounds can be skipped within the pattern to shorten the yoke for the smaller sizes, without ruining the look of the yoke design. None of this is particularly easy to calculate out, as the decisions are specific to each particular yoke design. You can’t just work 10 rounds, decrease, work 10 more, decrease, etc. You also have to remember that your decreases will affect the round BELOW. And, to top it off, charting a yoke pattern is something of a learned art as well. The weird triangle chart doesn’t much resemble the actual pattern when seen knitted in the sweater. In other words, designing a good yoke is really, really hard. I worked out all the basic patterns I wanted to use in the yoke, and looked at various yoke patterns to calculate out my decreases. But I really couldn’t finalize the design until I could try it out. I decided to use a yarn with equivalent gauge (Bartlett Yarns Fisherman 2-Ply) but easier to rip out if necessary. 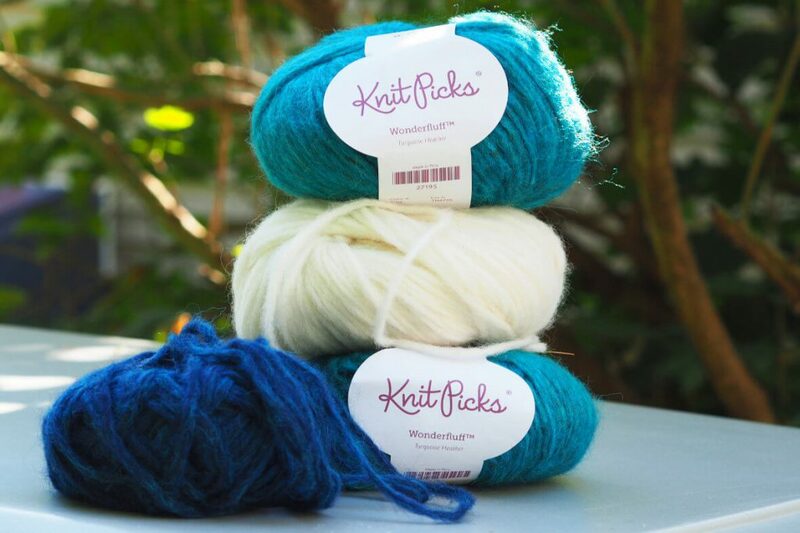 Bartlett Yarns is an old family favorite, and we have TONS of it in our stash. It was easy to go “shopping” in the stash and pick out three complementary colorways. I knitted the body, lengthening it a bit with respect to the traditional Lopi design. I knitted the two sleeves in the round and attached them to the body, with some stitches on a holder for the underarms. Finally, I attached the sleeves to the body and began working out my yoke pattern. It took a bit of work, but I was really happy with the final result. 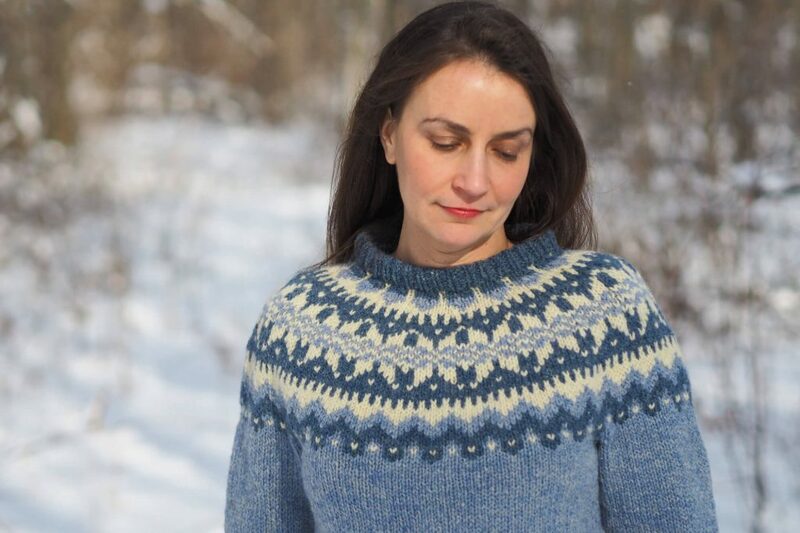 I knew my design was Icelandic-inspired, but definitely unique because the slightly smaller gauge allowed for a bit more detail in the patterning. Finally I used Elizabeth Zimmerman’s technique of adding short rows to the upper back to make the sweater sit better on the body. Yoke sweaters without short-row shaping tend to hike up in the front and hang down in the back, making for cold necks and constant yanking on the front sweater hem. After the short rows, I finished the neckline with a traditional doubled neckband, and voilà! Sweater complete! Knit Picks accepted my design and decided on neutral greys (Cobblestone Heather, Wellies, and Bare) for their photo sample. I love the colors they chose, because they show off the pattern gradations in the yoke so well. The neutral colors also make it clear that this pattern would work well for men and women. 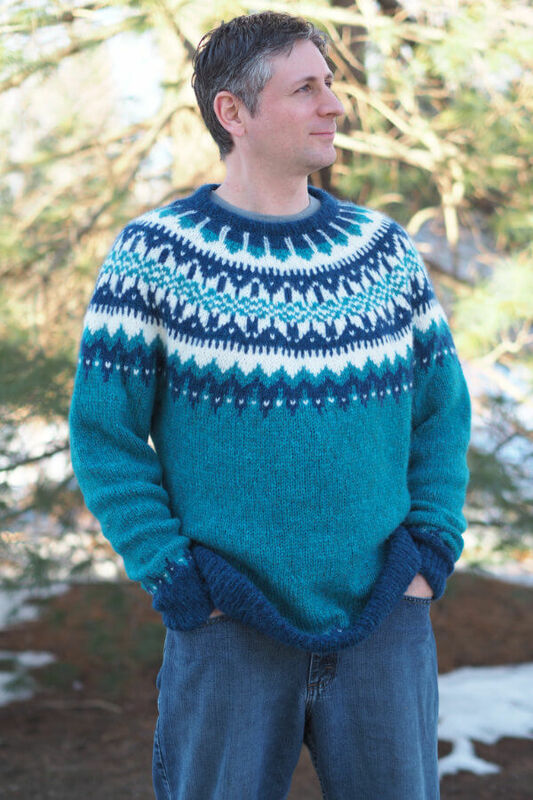 I also knit my own sample in Wonderfluff, but I chose much brighter colorways (Turquoise Heather, Atlantic Heather, and Bare). I wanted to photograph mine on a male model, just to reiterate the gender neutrality of the design. My cousin’s husband graciously offered himself as model. 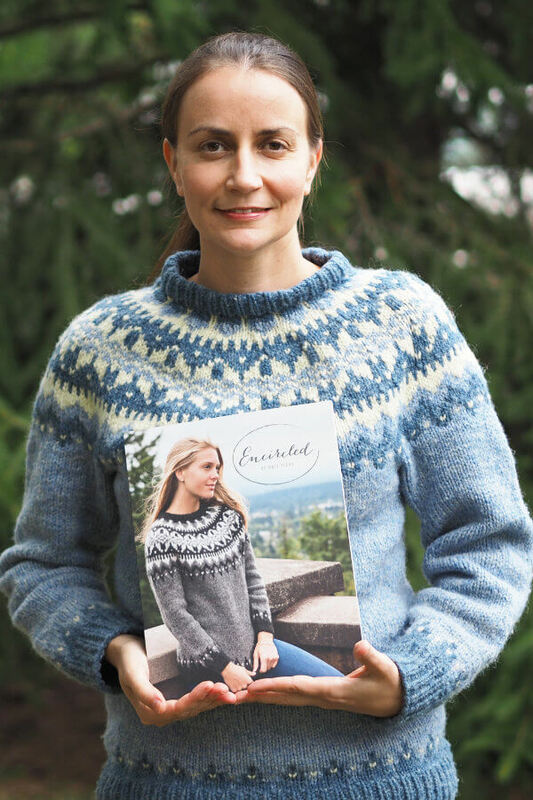 Knit Picks released the yoke collection, Encircled, on September 7, 2017. They had let me know previously that my Eldfell pattern was the top contender for the cover, but seeing it right there on the ACTUAL cover was really quite wonderful. I’m so honored to have my pattern chosen to highlight this beautiful collection!